Porto Montenegro and MYBA The Worldwide Yachting Association, are delighted to announce the inaugural MYBA Pop-Up Superyacht Show, taking place in Montenegro from 3rd to 5th September 2015. Over the last few years, Montenegro has become the new superyacht hotspot of the Mediterranean. Its yacht-friendly legislation, outside EU tax benefits (e.g. 0% VAT on charters, tax-and duty-free fuel) and rapidly growing infrastructure has superyachts flocking year-round to use this advantageous charter base and explore the 4000+ islands which line the coast from Croatia to Greece. 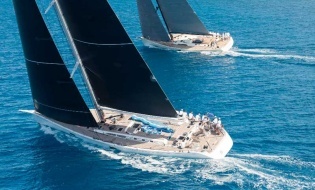 Porto Montenegro’s state-of-the-art facilities provide the ideal stage for the very first event of its kind in the region, where MYBA brokers, agents and yachts are invited to connect and do business in one of the world’s most spectacular cruising grounds. “We are delighted to be working alongside MYBA and to be the host destination of this new event concept. It will be a great opportunity to showcase the exceptional conditions Montenegro offers to superyachts where we are investing significantly to create a new commercial centre for the superyacht industry,” explains Oliver Corlette, Porto Montenegro Managing Director.